This post was previously published on a now defunct blog called Think! Language And Culture I used to write. I’ve dusted it off and republished it here for your reading pleasure. Taken from here. Originally published in Information Graphics by Sandra Rendgren (Taschen). Or, and it’s something I’ve been trying is to do, is to choose the second option to push yourself down that right channel, the path of growth. I say push yourself because it’s not easy, it’s hard work and requires you to think outside of your comfort zone. I’m doing this because I know the reward is to reach a higher level of achievement, a greater sense of understanding of myself and the universe, and an increase in my self-confidence. As the image shows us, there are two ways to approach life and learning. 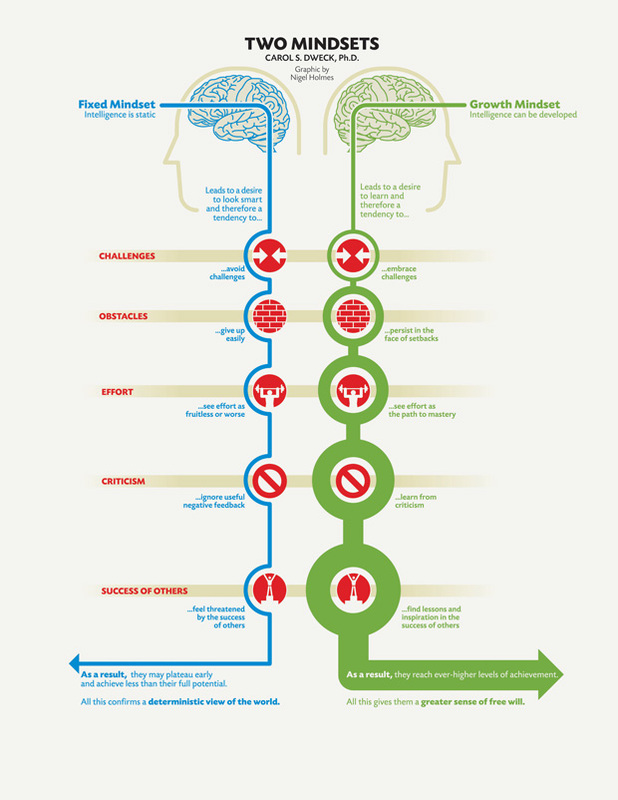 You can adopt the approach on the left, the closed minded, “fixed mindset” that prevents us from growing and improving. Every challenge is seen as a threat and any excuse to disengage is taken. I’m trying to choose the difficult path to progress rather than the easy path to atrophy. And that’s why these blog posts exist. But as language teachers and learners, we can also see how these options can relate specifically to language learning. It is clear that those students who adopt a “growth mindset” have a far greater opportunity for success than those who don’t. In fact, I would go so far as to say that those who choose the left path will never learn a language as they might say they wish. It’s at this point that I have to reflect on my own language learning and concede that I have often chosen the path of least resistance. I’ve never been a particularly comfortable language student (you can read about my troubles here), and in part this is due to the fact that I’ve rarely had a good teacher who could even recognise my difficulties, let alone help me with them. Of course I accept that it is ultimately the students individual responsibility to facilitate their own learning, but as a language teacher I feel it is my responsibility to help them along as much as I can. The position of a ‘fixed mindset’ is primarily going to be adopted because of fear. The student is frightened of looking stupid in front of the class or the teacher when they have an information gap, or realises that this part of language is something they have struggled with in the past and they don’t want to face it again, or some other reason that prevents learning. So the question I have to ask is how can I change this person’s mindset from fixed to growth? The first thing that springs to mind is openness. There’s no reason why you couldn’t print off this infographic and use it as the source of a lesson. Get the students discussing their own fears, worries and hang ups. Turn those fears into positive objectives which together you can plan to tackle over the duration of the course. Create challenges which are in line with their objectives. Ideally you want the students to be coming to you and saying “this is what I want to achieve and I want you to help me get there”. Don’t confuse their needs with your own perception of what their needs are. Doing some kind of needs analysis at the beginning of a course is a great way to do this. And as well as making sure you recognise their achievements, give them the mechanism to recognise their own achievements. Together, create course checklists, make goals which you pin up on the wall and come back to regularly. Get them to tell you and each other when they have achieved something, instead of it always coming from the teacher. Make sure that appraisal of their progress is a consistent part of their course. Make criticism an integral part of their studies, and most importantly, make most of it peer criticism. They will expect you as teacher to be the one who tells them how good or otherwise they are doing, but building peer feedback into their course right from the beginning is invaluable. They will need training and guidance, but once they have an understanding in how to give and receive criticism in the correct manner from each other they will begin to use it as a part of the improvement process. Give them the opportunity to find realistic role models. Discuss their heroes and what they have learned from them. Make them explain these characteristics and get them to discuss how they will try and include their influence in their own lives. This discussion doesn’t have to be limited to language learning, but their lives in general and hopefully the effect of consciously thinking about their influence will trickle down into their language learning. And finally, don’t be scared of taking yourself down that difficult path and do a little reflection yourself. Does part of their difficulty lie in the way your class is organised? Are your activities focused enough? Do you give them space and time to really achieve their objectives? Are you listening to them? The answers to these questions may be yes, but that doesn’t mean they shouldn’t be asked in the first place. It’s all part of having a growth mindset. Another point that’s kind of obvious but not said is that everyone reacts differently to tasks and the approaches to life here are blurred, where we may react in some of the ways on the left with some of the ways on the right. It’s helpful to be able to identify those in yourself and hopefully those in your students rather than pigeonholing either group to one or the other. Great post! I’m really interested in promoting a growth mindset in my classes with young learners. It’s sometimes difficult to do because it feels like a traditional, fixed mindset still prevails in their Primary School classes. It’s an uphill climb but we’re getting there. Thanks for posting on such a great topic! Previous Previous post: Punctuation Matters!